Monogame doesnt expose anything like the SwapChain for GL (Most likely for non direct compatibility) and it doesnt allow you to make more than 1 graphics device for GL based projects which prevents doing more than 1 control in winforms... This of course assuming you did something like TK and had a platform detection and custom method per platform to embed 1 context yourself - though since MonoGame ALSO seems to disallow graphics device creation outside of a game window at the same time it meens you are trying to embed the window itself rather than just a context handle. For the meens of making GL based controls work unless an official access can be grabbed for proper support directly within MonoGame ull have to use my method or some pinvoke hacks... Either way if you are choosing to use MonoGame within a winforms control in the first place you shouldnt be the type of person concerned with "multiple GPU support" or high end handlers outside of maybe a couple controls designed for making content editors for a game. Not only that if winforms + high end should be a huge concern -> MonoGame.Forms will do you just fine youll have to settle for being limited to windows/DX support only for high performance. So, I finally had time to take a deeper look at the OpenGL support and I want to share my experience and findings with this post -> related to the MonoGame.Forms feature set. The difference from the GitHub example from @SpiceyWolf and the MonoGame.Forms library is, that MonoGame.Forms doesn't use the Game class as well as it does not make use of the GraphicsDeviceManager from the MonoGame.Framework, because originally I had the vision of communicating with the MonoGame.Framwork from out of custom UserControl based classes, powered by Service classes to define own update routines and extra functionallity making the integration in a WindowsForms environment more smooth and easier to use by the end user, because we don't need an extra game project to hook up. When you simply try to create a GraphicsDevice in a DesktopGL project you will instantly receive errors. Right from the start it's quite obvious that we need to modify the source of the MonoGame.Framework to make that work. To create and initialize the GraphicsDevice successfully, it's necessary to construct the SDLGamePlatform, which for itself creates the SDLGameWindow by using the default BackBuffer Width and Height, which is okay. The only thing we are adding here is the SDL_WindowFlag SDL_WINDOW_OPENGL to make sure to internally create an OpenGL Context. Additionally and right after this, we initializing platform specific stuff by extracting the function PlatformInitialize from the GraphicsDeviceManager.SDL class. To render stuff from the BackBuffer to the GraphicsDeviceControl (Windows.Forms.Control), we need to get the BackBuffer Data from the GraphicsDevice and create a Bitmap from that to draw it in the OnPaint event. We are using this technique from the GitHub repo of @SpiceyWolf. GraphicsDevice.GetBackBufferData() is using Gl.ReadPixels [ref], which can be slow when calling this in short intervalls. It also increases the RAM usage by around ~30 to ~80 MB. You will also notice the decrease of performance the bigger the custom control is we are rendering to. Having a maximized window on a FullHD resolution with 2 rendering surfaces and the shortest intervall timer (1ms) raised my CPU usage to ~30%. Raising the intervall to 50ms results in CPU usage ~12% and still having a smooth editing experience (tested with the MultipleControls-Scenario of MonoGame.Forms and scrolling the HexMaps). Having a ControlSize of 728x399 and intervall of 1ms leads to ~60fps and ~10% CPU usage. Tested with Intel Core i5-7600K (non-overclocked). I also found a solution to make the GL.ReadPixels calls significantly faster by using Pixel Buffer Objects (PBO), but for that we need a BufferTarget which is currently not implemented in MonoGame which is GL_PIXEL_UNPACK_BUFFER. I tried implementing this by myself but received an invalid enum exception from OpenGL. So someone with more knowledge is needed here. This task should be very simple. Because we are creating the SDLGameWindow with the SDL_WINDOW_HIDDEN flag (it's invisible and never shown to the user), we are not receiving Keyboard, GamePad or Mouse input anymore. To resolve this we need to bring back the SDLEventQueue by calling SDLRunLoop manually after each draw of the BackBuffer. This atleast brings the GamePad input back. Keyboard and Mouse input are still not working because the hidden SDLWindow can't receive SDLEvents for Mouse and Keyboard. We resolve this by invoking these events manually by using the Sdl.PushEvent function. Well, the truth is a bit more complicated, because we first need to catch the Keyboard and Mouse events from WindowsForms and converting them to a format which SDL "understands". We do the same for MouseButtons and MouseMotion and start receiving Keyboard and Mouse events in the SDLEventQueue, which makes it also possible to use Keyboard.GetState() and Mouse.GetState() from the MonoGame.Framework (GamePad.GetState() also works of course). At some point I added window resizing support to MonoGame.Forms were it's possible to resize the window, which contains a custom user control and everything got updated accordingly, when a resize event occured (the drawn contents as well as the Camera2D position and custom RenderTargets). 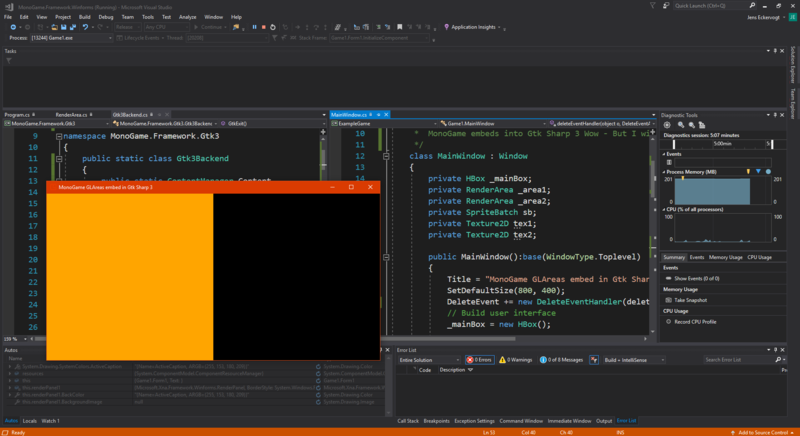 Critical here is the call to Sdl.Window.SetSize() which updates the hidden SDLWindow in the background for us. Currently RenderTargets are not functional, because it's not possible to set or dispose them. The reason for this is the Blocking of the UI Thread. When avoiding those calls we would receive GL Errors. If someone has a clue I will be happy to hear a solution. Making this changes and placing additions to the SDL backend made OpenGL support in MonoGame.Forms happen without changing in the core how the library works. Having an intervall timer led to an acceptable performance - even for UpdateWindows in realtime. It's also possible to make GL.ReadPixels faster in the future by using PBOs. DrawWindows with AutomaticInvalidation turned off only consuming ~1% CPU usage, which suites them perfect as preview controls for textures and all kind of stuff were a lot of draw calls to update the controls are not necessary. So let me hear what you think and most importantly: think about the above mentioned problems and try to help making the library better! Thank you all for your attention and suggestions / ideas so far! It's really appreciated. 2: I cant remember off the top of my head but i HAVE encountered a good few features between MonoGame DX and GL that exist but dont work in GL and hearing how your change in implimentation can work you MIGHT be able to cheat and make it a single dll compatible with both if you have an "Initializer" check to set a background variable like in the base class of the controls themselves or something and it be like IsGL or something -> Then when its initializing try to invoke one of the functions and determine if you are running in GL based on that (probably with the use of TryCatch) then have it use 1 set of stuff based on if GL and another if DX. Getting the keyboard and mouse events from WindowsForms is already possible just by subscribing to the corresponding events. This is also used internally to check if the mouse cursor is inside a (resized) control, but it's also possible to subscribe to those event from custom UserControls. The benefit of converting WindowsForms input to SDL input is, that this makes it possible to use the Keyboard.GetState() and Mouse.GetState() functionallity from the MonoGame.Framework. They are not working for themselfs. Another benefit is that you have a way faster click detection of the mouse buttons than with the WindowsForms mouse events, which can be very useful in editors as I experienced myself. Wow you're magician!!! I don't know how did you magic that? my god here is whitch in MonoGame's Community!!! Nice job Now I have tested. It is really nice trick. I have switch to Gtk Sharp 3. Performace slightly decreased, coz running in a virtual machine. I also want to more automate the compiling process by automatically create the NuGet packages for both platforms and such. But i'm very optimistic now to release the next major update at some point in the next week. Yeah, because: Why doing that extra work? Soooooooooooooooo I am happy because it works but it looks not finish. I have tested with Gtk Sharp 3. MonoGame "embeds" in Gtk Sharp 3 ^^. I think better Bin or Widget I will try to make Advanced RenderArea. What do you use monogame version? PS: It is impossible Google Search hides me. You use just MonoGame Framework 3.6 latest version ( from Github ) Please use WindowGL or LinuxGL or MacGL. Thanks! // e.Graphics.DrawImage(UniversalBackend.Present(), 0, 0, Width, Height); ??? I am surprised because it crashed now. How did you stop to Gtk Sharp 3. Oh my god how are apple and pengiun now? They are unhappy again. If Gtk Sharp 3 and MonoGame crash initialy. No no, I just used mono to compile the original MonoGame.Forms project. In the project itself I already use preprocessor directives to determine if DirectX or OpenGL is in use. There are no P/Invokes. Having one big DesktopGL project wouldn't make sense in the moment, because the WindowsDX project is still a lot faster. Reason for this is the SwapChainRenderTarget, which is still only available in a WindowsDX project. The "SwapChainRenderTarget.GL" in MonoGame.Forms still needs big performance improvements, but i'm optimistically to archive this performance boost with Pixel Buffer Objects in the future. It could make sense to open an issue on the MonoGame repo where we ask for the specific BufferTarget implementation. But first I want to release the basic structure. If linux user feels GTK interface for linux like ubuntu or xubuntu than he/she is happy if he/she work embedded MonoGame in gtk interface. If who uses WinForms under Ubuntu and it feels ugly. That is reason for append interface of current operating systems. Can we please be respectful an correct interface for current os? I already think that MonoGame.Forms should replace to MonoGame.UserInterface because it has more together different interface frameworks like WinForms, Gtk, Cocoa or Xammac. Please give us chance for replacement! Of course it is an interesting idea, but it also takes much time. 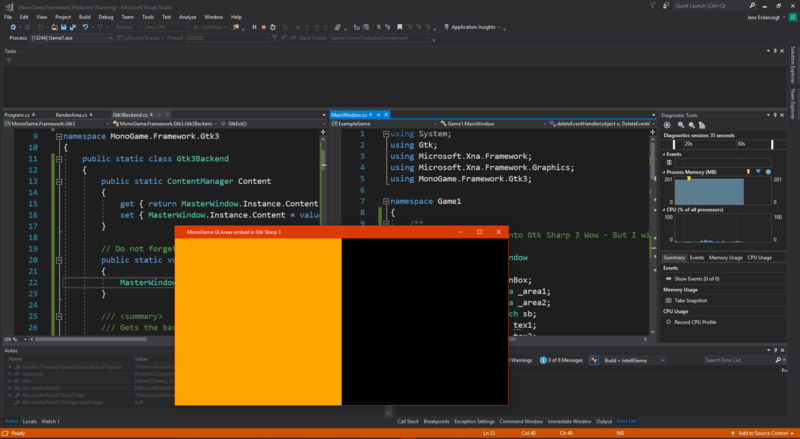 The good thing is, that MonoGame.Forms is open source, so it's possible for everyone to do own GUI integrations.